I blog a lot about sales conversations, productivity, goals, and overall business success. Why? It’s my mission to help others succeed – by equipping them with the skills, behaviors, and tools to do so. Because it is my focus I am in constant search mode for research, additional ideas, resources, and thought leaders in the world of sales, business, consulting, and life success. 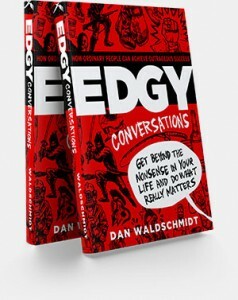 That’s how I read a new book by Dan Waldschmidt, EDGY Conversations: How Ordinary People Can Achieve Outrageous Success. Because I focus on sales conversation effectiveness , the word conversations is on my radar. Dan interviewed 1000 successful people over several years to determine what made them achieve their success. My last blog post focused on the Skill and Will of success. EDGY takes the Will factor and breaks it down to show that ordinary people CAN do extraordinary things as Dan Waldshmidt explains. Extraordinary doesn’t mean we have to set the world on fire – its living life fully, embracing our dreams, our passion, and our gifts to achieve our personal level of extraordinary success. It’s achieving what is important to YOU. The many examples he uses from different times, places, and ages of people build a very compelling case that we can ALL be extraordinary. The book began with an opener that grabbed me and propelled me into the following pages. I read the book, folded page corners to return to, and soaked in his energy that leaped off the pages. As a practical, ‘how to’ person, I really appreciated the ‘how to’ parts of the book which elevated this book from just another ‘feel good’ and makes it timeless. You can hear Dan talk about his research and why he wrote the book here. If you order the book Dan will send you a free workbook! Heck, we all have the opportunity to be extraordinary, Dan helps us unleash some of the energy and examples that can help us vision what that means for us and then to get out there and do it! Please note: I am in no way compensated for my endorsement of the book. I’m passing along a ‘kick you in your pants’ resource!